August 1 is the official release date of the 45544 LEGO MINDSTORMS Education EV3 Core set. To celebrate this fact and to show you a bit more about what you will find in this set and how it was put together, HispaBrick Magazine talked to the lead designer for this set. In case you haven’t heard of him before, let me introduce you to Lee Magpili. You may have seen some of his other creations, like VALENTINE, the red dragon that was shown at LEGOWorld Copenhagen and EV-AN the EV3 android that has been traveling along with the EV3 Education presentations to different events. HBM: Did the models influence the choice of sensors to be included in the set, or was it the other way around? What were the considerations behind a sensor assortment so different from the retail EV3 set? LM: We really had to go with what made sense in a classroom or educational setting here, even competitions were taken into account. Every brick, and HW piece have been chosen with that in mind. Of course the models needed to have a clever way to use them to make sense. The addition of the second touch sensor, for example, came late in the process, so it wasn’t easy or possible to include a model that had two touch sensors. Including the ultrasonic sensor instead of the IR sensor was a matter of precision. Schools, educators, robotic competitors wanted the precision of the US sensor so that made more sense to have in there. The gyro sensor was a big question in that we had to come up with a way to make it simple enough for younger students to use and understand. I think we came up with a great assortment that will add some great new functionalities to new robots students make. HBM: A lot of open frame pieces (e.g. 64179) are used in the base set and the expansion set. How has the availability of this kind of piece influenced the design process? LM: I personally really love the frames as building elements and use them in so many of my own models. This element has been found to make building so much easier and sturdier so we really wanted it to be a feature in our sets. Even the motor design had these elements in mind so that we could use them more efficiently. Of course we discussed a number of other questions as well. You can read the entire interview in HispaBrick Magazine 017 which will be out in a couple of days. This time, I'd like to raise your attention for a fully PF robotic model, by piotrek839, representing the humanoid robot from Terminator series (T-101 from Terminator 3 in the present case). 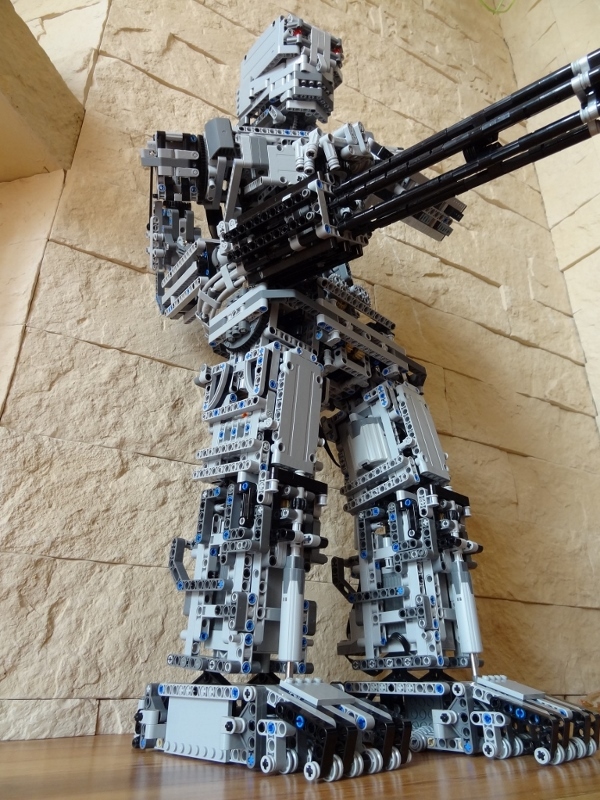 Is of course a robot limited to set of movements, rather an autonomous machine, but still an amazing work made with huge amount of LEGO Technic elements. You can find additional photos and CAD renders of the mechanisms, at piotrek's Brickshelf folder. And his own description of the model at EB. As usual in the Technic theme, the set comes with 2 different models, and due to the relatively small size, both sets of instructions come in printed form. This is one thing I rather enjoy about this kind of sets as it is rather a nuisance to build from poor quality PDFs on a computer screen. Each construction is contained in a single instruction booklet and there is a small sticker sheet with 8 stickers. These are mainly applied to the panels in the set and the flaming pattern does make the set look a bit more attractive as well as somewhat more aggressive. The parts are packed in three separate bags and the tires and rims come loose in the box. None of these are new, but it is the first time the C-frames (92910) with ball socket and their corresponding counterparts (92911) are included in a smaller set, so if you were looking for the basic parts to make this kind of all-terrain vehicle, this is the set you were waiting for. Construction of the set starts with the “core” of the model. You can see the know wheels that connect the HOG to the front and rear axles and the two CUPS through which the steering axle is connected by means of u-joint which are protected inside “cup and ball” combination. Next the C-frames are connected. The blue axle pins that are inserted into the long racks limit the travel of the mechanism considerably. Some kind of limitation is necessary to avoid the rack from moving out from under the pinion (a 12 tooth double bevel gear that is added later), but the use of the blue axle pins means the turning circle of the 42005 is larger than I expected. A different solution with a much wider range of movement is applied in the secondary model. Even so, since both the front and rear axles steer the accumulated turning males the circle smaller than you might fear. Before attaching the axles to the body, you need to put the pinion (the black 12 tooth double bevel gear) onto the axle that comes out of the core of the model and the booklet indicates a very specific position for the gear + half bush. Since you can only attach them from one side (the other is already connected to the u-joint) I first thought this specific position of 1,5 unit was crucial to the operation of the model. Nothing could be farther from the truth. You needn’t worry too much about this position: the gear should not be over the rack (yet) and the half bush should be far enough in the axle to allow inserting it into the central hole of the angle connector on the steering sub-assembly, but a 1 unit distance from the end of the axle is fine too and much easier to achieve (I suppose most of you use the same technique as I do: putting the elements on the axe and then placing the end of the axle into the hole of a technic beam, adjusting the bush and gear to that position which is exactly 1 unit) . After sliding the pinions over the racks this structure is removed and the parts reused in the top of the model. The red ??? you see are the attachments for the suspension. In this step you can also see 2 of the 4 black links that connect the axles to the core (2 on each side). As can be seen below, it now becomes clear why the red bush was added after attaching the C-frames and some additional gracing is added to keep the suspension in place. A curious detail in this set is that only one seat is included on the driver’s side. I instinctively tried to build the mirror image when the steps for the seat came up, but I couldn’t find the parts… with good reason. An additional seat would have been nice although that would have added to the parts count as well as to the number of parts that are not used in the secondary model. There is little else to say about the top structure other than that it has a nice enough look and that the stickers provide the necessary extra detail to make the model little more attractive. You can see the two air intakes on the bonnet. I don’t like putting stickers on beams, but for the sake of completeness of this review I applied them. The overall look of the model is quite attractive. In the picture below, the wheels are turned to the maximum which, as you can see, is not very far. As in (almost) all LEGO models, the stiffness of the shock breakers means that the standard position of these is fully expanded, but again that is hardly a surprise. Aside from steering on both the front and rear axles and independent suspension of all four wheels there are no additional functions. There is not much to say about the secondary model, other than a few observations regarding the differences between the two. Another salient fact is the suspension. In this case the suspension is much less elaborate – not individual for each wheel – and there is a certain (inevitable) feeling of emptiness at the back of the model. I have been over the instructions twice, but I have yet to figure out what it is needed for in this place. I agree that it is nicer to have a completely different secondary model instead of a variation on the top, like in the 42001, but I still think it is a pity so many of the cool elements of this set have not been reused. As I mentioned before, this is the first set that contains the C-frame (Steering Ball Joint Large Open with C-Shape Pivot Frame) and the “cup” (Steering Ball Joint Large Receptacle), but due to its size it lacks the portal axle parts for a more advanced rough terrain vehicle. The Monster Buggy immediately reminded me of the 8858 Rebel Wrecker – more than of what might be thought of as its modern big brother, the 9398 4x4 Crawler. However the Rebel wrecker had mixed suspension, but sported a working crane in the back. Technic models have become much sturdier over time and new parts have brought interesting innovations. As such, this set certainly is a sturdy toy, even if an additional function, like a winch or crane would have been a nice touch. While this set contains absolutely no new parts, it is the first time some “advanced” parts are available in a set of this size. Simple, but sturdy. A completely different secondary model also weighs in here despite the fact that is uses far less parts none of the really interesting ones.